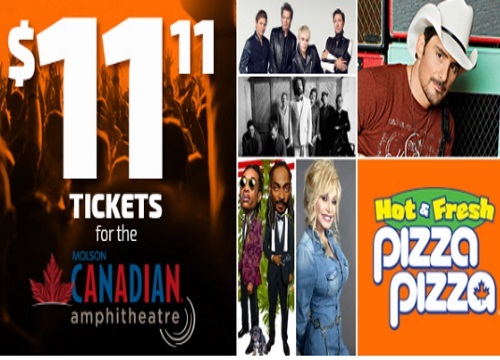 Pizza Pizza's popular Molson Amphitheatre concert deal is back this summer! Get tickets to select concerts for only $11.11 (plus charges). There are 17 concerts eligible for this offer listed below. Enter the promo code 1111PIZZAPIZZA to get the discount. Tickets are while quantities last. Check back often as new shows and additional tickets may be added. Service charges and taxes may apply, including a facilities charge of $4.25. Limit of 1 order per household, limit of 2 tickets per order.